The HydroGarden Weston Beach Race 2017, which attracted over 70,000 people to Weston-Super-Mare over the course of the weekend for the 35th running of the event, saw an outstanding weekend of racing that concluded with local-lad Todd Kellett earning a second consecutive win (October 15) following a flawless race in the adult solo category. Enduro legend David Knight took an impressive second place result with Martin Barr taking to the podium in third. Jens Walvoort and Jak Taylor won the morning’s 85cc Big Wheel and Small Wheel classes. With a plethora of high-profile riders lining up to compete at this year’s event, which is a true battle of man and machine where anything really can happen, it was certainly difficult to predict the outcome of the highlight adult solo race. Kellett, who finished on the podium in the RPG Racing 4×4 quad class with his brother Ty, fired out of the gate to enjoy an incredible start aboard his St Blazey MX/SJ Hodder Husqvarna. Close behind down the 1.5-mile straight, Red Bull KTM Factory Racing’s Jonny Walker was second with Ashley Greedy third. Knight was fourth with Luke Hawkins fifth and British MX1 Champion Graeme Irwin sixth. By the halfway point Kellett had enjoyed a perfect pit stop, while Barr managed to edge into second and Knighter took up third. Greedy went on to eventually drop back to sixth, while Irwin suffered issues and was forced to retire from the proceedings. Kellett’s consistency and speed throughout the gruelling three-hour race was relentless and the 20-year-old Somerset rider was untouchable in the closing stages, as he brought his machine home to take a well-earned victory. 39-year-old Manxman David Knight, who was the last person to win back-to-back events here in 2010/2011, took the runner-up spot after pushing his bike over the line and was the only other rider to finish on the same number of laps as Kellett. 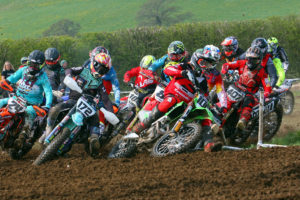 Buildbase Honda rider Martin Barr from Northern Ireland equalled his debut result from last year with a podium third in what was a spectacular battle of the amateurs against the pros at a near capacity entry of over 800 riders. Ross Parkinson was presented the HydroGarden Weston Beach Race young gun award in memory of Dan Horton-Tilley as the highest placed 19-year-old with his 81st position. Jonny Walker concluded the event two-places higher than last year after making a number of unscheduled pit stops early on in the race. He finished fourth while Jamie Wainwright climbed back from 10th in the early part of the race to fifth place. Guy Martin, who is known for his record breaking two-wheeled exploits, made a valiant effort to race a Honda Africa Twin around the course, although this proved troublesome for the Lincolnshire-lad and he was forced to retire after battling with the notorious Weston-Super-Mare dunes. The Over 40’s class was won by Dutch rider Ton Van Grinsven with Robert Clark second and Andy Frost in third. In the junior 85cc classes HydroGarden Weston Beach Race first-timer Jens Walvoort from The Netherlands took a popular victory in the big wheel class, with Louie Kessell second and Lewis Wood third after the one-hour-30-minute-long race. Jak Taylor took a hard-fought win in the small wheel category with Bailey Johnston second and Raife Broadley in third position. Feature Quad Racer Harry Walker’s brilliant continues with Weston win! Quad Stunt man Paul Hannam set to hit Weston this weekend!